Each summer, Kent offers programs designed to give high school students, including those who will be beginning ninth grade, the chance to experience engineering, entrepreneurship, Global Development, and more with top professors from around the globe. For information about or enrollment in SEEK, please click here or contact seek@kent-school.edu. MasterChef Jr. has inspired millions of kids to up their skills in the kitchen and aspire to careers in the culinary arts. 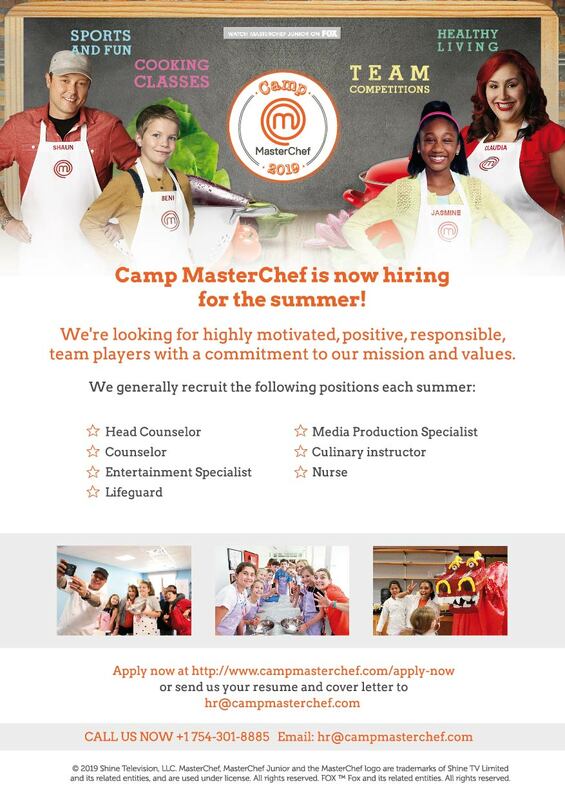 For the first time in the United States, the culinary experts at MasterChef have opened the doors to Camp MasterChef so that all children have the opportunity to live this unique and magical experience as if they were on MasterChef Jr.
Camp MasterChef opened in June of 2018 in Kent, CT. One or two-week overnight camps were themed to include special competitions, hands-on cooking lessons, outdoor sports activities and interactive challenges. Kent School held the first edition of Camp MasterChef in the US summer. Endemol Shine North America, producer of MasterChef and MasterChef Jr. and FOX TV joined forces with experts in summer learning experiences to launch Camp MasterChef, where kids will improve their culinary capabilities. Campers sharpen their culinary skills under instruction from expert chefs. They also develop healthy lifestyle and personal growth skills alongside training by a staff of culinary professionals and counselors. Campers interact with MasterChef and MasterChef Junior contestants. Camp includes comfortable dormitories, open fields, modern sports facilities, swimming, and other amenities to make it a summer to remember. The Camp MasterChef mission is to engage aspiring home cooks with an exciting, enriching culinary experience. Campers develop strong cooking capabilities, healthy lifestyle habits, and personal growth skills while having the time of their lives. Through team challenges and competitions, they form strong connections and create unforgettable memories together. The camp welcomes all skill levels and offers various culinary programs and activities based on age and experience. For detailed information and to register for Camp MasterChef, please visit http://www.campmasterchef.com. Interested in working at the camp? Information about employment can be found here. Joel Ross Tennis Camp will be returning to Kent School for its 29th year. Residential campers come from 1-5 weeks beginning June 30 thru August 5 & can choose tennis or squash in one week increments. For more information, please visit www.joelrosstennis.com, email Joel at info@joelrosstennis.com, or call 914-391-3335. Paint in the Woods offers high school-level students an exciting one-two-week program in the practice and understanding of the visual arts. This innovative program is sponsored and directed by Rob Ober, a twenty-seven year member of the teaching faculty at Kent School. Rob also owns Ober Gallery in the town of Kent. The program encourages its participants to allow their own inner spirit to direct their creative output. Instead of technical instruction, the program offers students the opportunity to learn about the creative process as understood by deceased and living artists such as Delacroix, Picasso, Dubuffet, Matisse, Guston, Mitchell, Polke, Katherine Bradford, and Ai Weiwei. We will watch interviews with these artists. We will read what Delacroix and Malevich had to say about the creative process. We will watch films about about Van Gogh, Picasso and others. “Paint in the Woods” speaks to the need of every artist to lose oneself “in the woods”… to animate their own creative self. Participants will have the opportunity to meet important contemporary artists and curators associated with the New York art scene, and to visit museums and auction houses. The program is intended to benefit those intent upon a career in the arts as well as those who simply want art to count for much in the course of their own chosen careers. For more information, contact Rob at paintinthewoodsct@gmail.com.